Not away ! to the heat ! I had to put the heating on today, lol ! Gattina — I have my doors and windows open! I learnt it from all these here bloggers. This is perfect with the heat wave hitting the mainland. Kay — that heat wave missed us, but I know it hit the sign in the photo. I know how she feels. It is so hot. And we have a hurricane coming up our coast too. Not cool, man. Batten down the hatches and hang on! This would almost be something my Mom would do or I would do to her-hehe- I’m so going to be giggling in my sleep tonight as I think about this. OJM — you are an evil one. Uncool place to visit, but a cool MM. LOL! I never heard “dagnam”… my dad used to say dagnabbit! or dag-gummit! Harsh stuff, I tell ya! Melli — I’ve heard all three words from various members of my family. My father rarely curses so these were his words. LOL! As hot as I get, I think I’d be disappointed, too, if I had thought we were going somewhere cool and ended up in a town named Coolville. I wonder if it was named in the 60s. 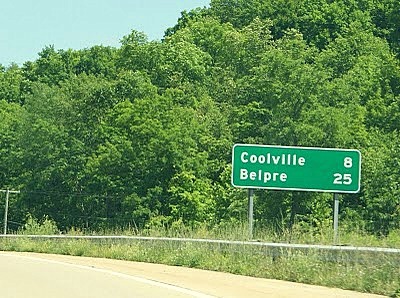 Coolville must be around these parts, then, because we’re still in the mid-90’s. Karen — send some heat here — just 5 degrees or so for a couple of weeks. Okay? Haha, great take on the picture Quilly – I love it! Ya jest caint trust Junior, so Ma, ya oughta larn how ta drahv. Maybe go onwards to Belpre, Quilly. It looks way cooler. LOL. What a funny story. Great take on the picture. Mama needs to learn that it’s not nice to hit! LOL. Your meme made me laugh. Cheers! How did you KNOW this was taken in Appalachia? ROFL And yes, we’ve been sitting (settin’ ?) around the mall and Dairy Queen lately, with the rest of the rednecks, enjoying the free air conditioning.